“Syria” | Stop the US Madness: it's time to take action! Unfortunately this is pretty typical of main stream media these days. It’s unfortunate that so many reporters have lost their integrity and that main stream media bows to the powers that be. Reporters used to be who people could count on for “under cover investigations” and digging up the truth. This country is in a sad, sad state. Astounding footage has emerged of ‘Syria Danny’ – the dubious “activist” who appears on mainstream news every week begging for a US or Israeli military invasion – in which he apparently coordinates gunfire and explosions to be staged during his interview with CNN. As we have previously documented, ‘Syria Danny’ is a 22-year-old British citizen of Syrian descent from Cambridge. After returning from Homs in summer last year, he lived in London for a few months before returning to Syria in December, from which point onwards he became the poster child for a western military intervention in Syria, begging almost daily on CNN for the United States or even Israel to bombard the country. The clip above shows Danny being connected to CNN for one of the many interviews the station has conducted within him over the last few months. While waiting to be connected, Danny says, “Well, let the gunfire sound then,” before subsequently asking someone off camera, “Did you tell him to get the gunfire ready?” An explosion is heard soon after, but Danny doesn’t even flinch. The person working the camera, Danny himself, and at least one person off camera, clearly appear to be coordinating staged gunfire and explosions to coincide with the CNN interview. The cameraman then reminds Danny to talk about recovering dead bodies before the interview with Anderson Cooper begins. The talking point about Assad’s forces carrying out indiscriminate violence is strongly emphasized. Despite the threat of the violence he claims is occurring all around him, in addition to his high profile as a media-friendly anti-regime activist which would make him a prime target, Danny seems remarkably calm and composed in an environment one would expect to be fraught with tension. At one point, he even appears to be bored, jokingly asking for a mattress. Observers have noted that Danny’s stories about the violence he claims to have witnessed appear to change each time he appears on a different news show, suggesting he is embellishing or outright manufacturing his testimony. In another clip, footage presented by the mainstream media as depicting “government shelling” of innocent citizens actually shows the camera shot being set up hours beforehand, ready to capture an attack on an oil refinery in the city of Homs which occurred on February 8. There is no evidence of tanks or “shelling” and the clip was likely produced by the same terrorists who blew up the oil refinery. With some sources predicting that the NATO invasion of Syria could take place as soon as this month, it’s guaranteed that we will witness a great deal more propaganda broadcast by the mainstream media to perpetuate the myth that Assad’s forces are indiscriminately killing innocent “activists,” when in reality the opposition is comprised of armed rebels and Al-Qaeda terrorists who have also been responsible for indiscriminate violence. "‘Syria Danny’ Caught Staging CNN War Propaganda Stunt"
"CNN doesn't report real news"
"Syria Danny is a liar"
If you know anything about the US government or their operations then you already know Osama Binladen used to work for the US government. It was only when they could no longer control him that we decided to make him the scape goat for the 9/11 attacks. 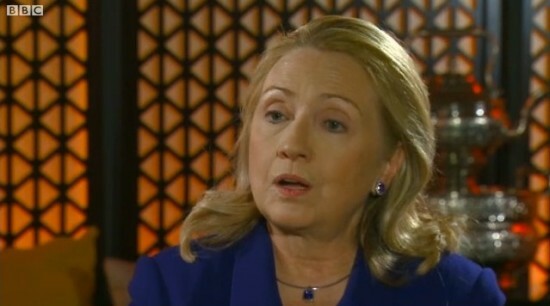 "Hillary Clinton Admits US and Al-Qaeda On Same Side in Syria"
"Secretary of State Hillary Clinton"